Kitty Glitter is an online video slot machine game from IGT (International Game Technology) that has been released in March 2010. This online video slot machine game has 5 reels and 30 pay lines. The theme of Kitty Glitter is, as its name implies, inspired by four of the cutest and cuddliest cats of the world – the white Persian, orange tabby, calico, and the Siamese. Most people think that most IGT developers have a certain admiration for animals, and maybe that’s the reason why they are so good when it comes to creating slots games with an animal theme to it. If you have never played the Kitty Glitter slot game before, you will surely love playing in this slot game because it has wild symbols, scatter symbols, a unique Diamond Accumulator Feature, and a Free Spin Bonus Feature game wherein you can get up to a maximum of 225 Free Spins! It is perfectly natural for online slots players to try out the free play mode first whenever they happen to come across a slot game they have never played on before. The reason for this is that they would like to assess whether or not that a particular slot game is worthy enough to spend their real money on. Fortunately, you can play online slot games powered by IGT absolutely for free, without bothering to download anything! Kitty Glitter online video slot game is perfectly a fun and exciting game to play at, especially if you are a cat lover and you also love to play slots as well. Kitty Glitter offers its online slot players Free Spins (with up to 225 Free Spins), wild substitutes, scatter wins, the unique Diamond Accumulator Feature, a maximum coin jackpot of 1,000, and a maximum cash jackpot of £250,000, and last but not least, it has a 93.51% to 94.92% theoretical RTP (return to player)! Known for being one of the leading slots manufacturers in the whole world by both land-based and online slots players, IGT (International Game Technology) brings to the online gaming world one of their slot games that has been considered to be very popular in casinos on the strip in Las Vegas – the Kitty Glitter slot machine game. It seems like animals are a favorite theme among the developers of IGT, so it is no wonder that the Kitty Glitter slot machine game is pretty well made. The symbols used in the game are pretty lifelike, not drawn in a cartoonish manner. When you get winning combinations with the four cats, they will become animated, showing you their full bodies as you get paid out your winnings (the symbols originally show only the heads of the cats). The background of the reels is of a solid color, which makes the reels look neat and the symbols are a lot better to view. The outer surrounding of the reels is full of glittery sparkles, a pretty simple effect to complement the slot game. The overall graphic design of Kitty Glitter shows many different colors such as blue, green, red, pink, purple, yellow, black, brown, white and orange. When you spin the reels, simple background music is played, which is quite similar with other IGT slots games. Different celebratory background music will fill your ears whenever you hit winning combinations. When you manage to trigger the Kitty Glitter Bonus Feature game, the music of “Putting on the Ritz” will be heard as you play out your Free Spins. 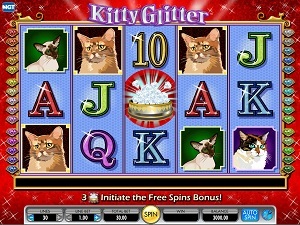 In Kitty Glitter online video slot game, the card deck symbols available are 10, J, Q, K, and Ace. Other regular symbols include famous and cuddly cats of world such as the white Persian cat, the orange Tabby cat, the Calico cat, and the Siamese cat. The Wild Symbol is the Kitty Glitter Logo symbol. The Kitty Glitter Logo (wild symbol) acts as a substitute for all other symbols (except for the scatter symbol) in order to help you complete a winning combination. The Kitty Glitter Logo wild symbols only appear on the 2nd, 3rd, 4th and 5th reels. The Scatter Symbol is the Kitty Bowl of Diamonds symbol. Scatter symbols mean that they do not need to appear in a line (on an enabled pay line) for you to win. The Kitty Bowl of Diamonds scatter symbol can be scattered anywhere on the 2nd, 3rd, and 4th reels only. If you hit 3 Kitty Bowl of Diamonds scatter symbols (anywhere on the 2nd, 3rd, or 4th reels), you will activate the Kitty Glitter Free Spin Bonus Feature game. Please take note that the Kitty Bowl of Diamonds scatter symbols do not give out any winnings; but they are your ticket to enter the Kitty Glitter Free Spin Bonus Feature game. In the Kitty Glitter online video slot game, IGT has created 2 Bonus Features for their players – the Diamond Accumulator Feature, and the standard Free Spin Bonus Feature game. • Diamond Accumulator Feature – The Diamond symbol is a wild symbol in the Kitty Glitter Free Spin Bonus Feature game, and each time one comes out on the 5th reel, it is saved in a special on-screen Diamond Accumulator. Obtain a total of 3 Diamonds and all White Persian Cat symbols will become Wild on reels 2, 3, 4 and 5. The White Persian Cats become wild on the spin, the third Diamond is collected and for all subsequent spins during the Kitty Glitter Free Spin Bonus Feature game. • 3 Diamonds: The White Persian Cat is wild on the 2nd, 3rd, 4th and 5th reels. • 6 Diamonds: The Orange Tabby Cat is also wild on the 2nd, 3rd, 4th and 5th reels. • 9 Diamonds: The Calico Cat is also wild on the 2nd, 3rd, 4th and 5th reels. • 12 Diamonds: The Siamese Cat is also wild on the 2nd, 3rd, 4th and 5th reels. After obtaining 12 Diamond symbols, no more Diamonds can be collected, but the Diamond symbol stays wild. When the Kitty Glitter Free Spin Bonus Feature game ends, then all the Diamond Accumulators are emptied out. • Free Spin Bonus Feature Game – If you hit 3 or more Kitty Bowl of Diamonds scatter symbols (that can be found scattered anywhere on the 2nd, 3rd, and/or 4th reel, you will trigger the Kitty Glitter Free Spin Bonus Feature game. The Kitty Glitter Free Spin Bonus Feature game is started with 15 Free Spins. All of the bets and pay lines that are played in the Free Spins are exactly the same as the spin that activated the Kitty Glitter Free Spin Bonus Feature game. You can re-trigger the Kitty Glitter Free Spin Bonus Feature game if you obtain another 3 Kitty Bowl of Diamonds scatter symbols (anywhere on the 2nd, 3rd and 4th reels), wherein you are given another set of 15 Free Spins! You can actually re-trigger the Kitty Glitter Free Spin Bonus Feature game many times, up to a maximum of 225 Free Spins! The Kitty Glitter Free Spin Bonus Feature game will end when the Free Spin counter reaches 0, or after the 225 Free Spins have been used up, or if the Top Reward limit of £250,000 has been attained. Do take note that the maximum win on any transaction is capped at £250,000 currency units (for instance, in pounds). A transaction will include the results of the Free Spins plus the outcome, which activated the Free Spin Bonus Feature game. When the Free Spin Bonus Feature game is over, you will be taken back to the main Kitty Glitter online video slot game, and your Free Spin winnings are included to your total balance. Kitty Glitter has 5 reels where you may bet on as many as 30 pay lines. The minimum bet is 1p and the maximum bet is £10 per line. You can wager only 1 coin per pay line bet. It is absolutely more fun and easy when there is an Auto Spin function available in online slot games. In Kitty Glitter, you can access their Auto Spin function by clicking on the Auto Spin button on the lower right corner of the screen. You are given the choice of how many spins you would like the game to do automatically for you – from as low as 10 up to as high as 50 Auto spins. When you choose a number, say 10, the Auto spin will keep track of the remaining number of auto spins. The Auto Spin will stop only when a Bonus is triggered or the balance is insufficient to spin again. Also, you are actually given the option to stop the Auto Spin yourself, just in case you want to.